Lofty turns the machine shelter into a makeshift house - with chaotic results. Bob has trouble designing his dream house in Sunflower Valley. Roley accidentally skids and knocks down the old machine shelter. Muck loves to get mucky, so is horrified to find that Bob has built a machine wash.
Bob and his dad build an observatory so that everyone can watch a comet. As Bob and team build a drive-in cinema, Oscar Flicks's sea monster movie starts filming. 8. 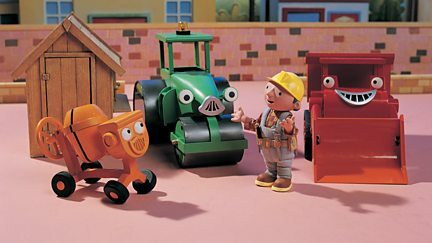 Bob the Builder: Project Build It: Series 6, Go Mr Bentley Go! Bob and the team build an exercise park, and Mr Bentley takes on a personal trainer. Tumbler the cement mixer arrives in the valley to help build the Bobland Bay skate park. Flex the cherry picker arrives in Sunflower Valley to help replace the lighthouse lens. Bob and the team are building an ice-cream parlour at Bobland Bay. Scoop worries that Benny will replace him as Bob's number one machine. When the first guests arrive at the Bobland Bay Hotel, Spud decides to help out. Tumbler tries to think of a design idea for the new Bobland Bay promenade. Bristle, the street cleaner, arrives in Bobland Bay just in time for the grand opening.